Today was another fantastic day of kettlebell and Insanity work. I’m continuing the Phase 1 DvD of Skogg at home. Today I did a level 2 strength workout (First Class). It was a good change of pace to the other workouts on the DvD. Since it was a strength workout, you lift as heavy as you can with a low rep count. My heaviest bell is a 16kg (35lb) bell so there were times I “stacked” a 26lb and a 35lb bell together to be able to lift heavier on some of the exercises. I did the 6 basic kettlebell moves each for 3 reps each side in tabata fashion. 15 sec on 15 sec off as heavy as I could go. After a protein shake and a couple hours later, I got right to it and popped in the Pure Cadrio DvD from Insanity before it got too late and before I psyche myself out of it. I almost lost it right after the level 2 drills. It’s a 35 minute workout without any breaks so by the time I reached that part, I was getting winded. 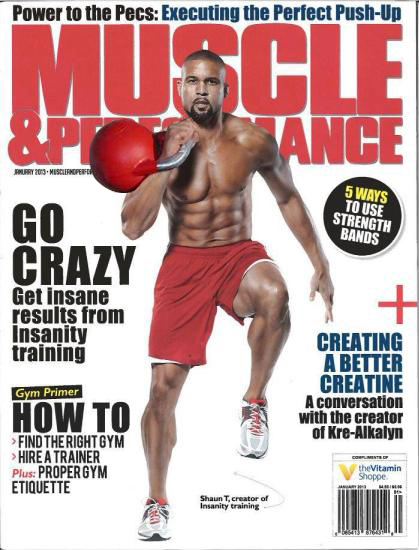 Shaun T always mentions to take a break when your sacrificing your form. True enough when working with kettlebells as well. The intensity picks up with more suicide jumps (burpees) and push up variations. By the time I reached the cool down, I’ve noticed that I’m getting more flexible in my hip flexors. I’m able to squat low to the ground without picking up my heals. This will come in handy for when I do Keith Weber’s kettlebell DvD and have to perform overhead squats. Time to rest and grab something to eat. I’m heading over to Trader Joes and picking up some sirloin, chicken breast, veggies, nuts and fruits for my mussles – ha. Woke up today and felt tired and sore. 2 a day workouts are getting to me slowly. Lucky for me today was my day off from kettlebell lifting and Cardio Recovery was on the Insanity workout schedule. I definitely felt the burn during the deep squats, pulses and lunges. I have to admit I know it’s a recovery day but it felt strange not sweating during the workout. 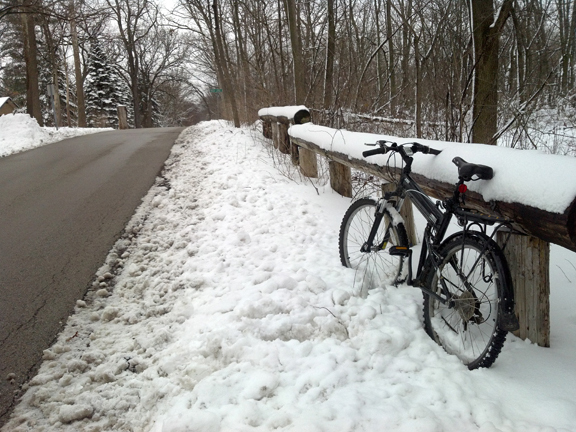 I decided to go for a 8 mile bike ride to the bank in the middle of winter here in 30 degree weather Chicago fresh from a 4″ snowfall. I decided to go ahead and do cardio abs DvD this evening as well. I can handle the jump tucks but have trouble holding the c-position. My gut gets in the way and I feel I’m using my hip flexors more than my abdominals. Tomorrow, back to kettlebells and pure cardio! Insanity is no joke. 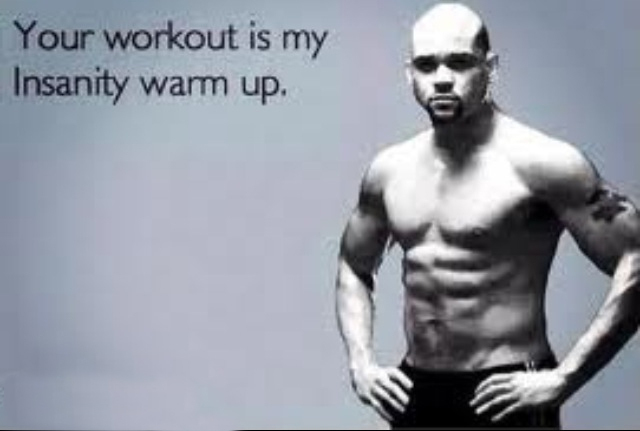 If it’s been awhile since you’ve workout out, Insanity may not be the workout for you. Which is why many get discouraged and quit the program. There’s a lot of plyometric movements with only 30 seconds breaks so your heart rate barely has anytime to recover. I woke up feeling tire and sore from doing my 2 a day workouts yesterday but in time, my body will get used to the new routine. I first did Michael Skogg at Home Phase 1 DvD. I did the second class of power today. Even though these are considered stand alone workouts, they make for excellent warmup or finishers. I followed up my kettlebell workout with Cardio Power and Resistance DvD from Insanity. At first I didn’t think I would have enough energy to complete the workout but noticed that it was my mind that was trying to psych me out of doing this workout. I just pushed on through and before I knew it, I was focused and sweating. Some of my favorite exercises from this DvD are power jumps, walking pushups, v pushups and floor sprints. At the start of the DvD I had my doubts but when I reached the end of the workout, it felt really worthwhile and I was beaming with self-accomplishment. I can not be or will be stopped! New week, new 60 Day Challenge. For the next 60 days, I will be working out 4 days a week/ 2 a day workouts performing a variety of exercises, mainly kettlebell, TRX, jump roping, cycling, yoga and doing the Insanity workouts. My goal is to lose another 10 pounds (179.6 lb now) and drop my body fat into the teens (20.8% now). Along the way, I plan to participate in 5K runs and cycling events. In a month, I’ll be traveling to Michigan to partake in a Killer Gravel Road Race, Barry Roubaix. That will be a good bench mark to see how far I’ve come and to test my strength and endurance both mentally and physically at the half way point of my personal challenge. All of this while eating a paleo-ish diet of lean meats and low glycemic vegetables. Today’s workout consisted of a power focused kettlebell and body weight workout in the morning. It was a 2 minute tabata of 4 sets of over head walking kettlebell lunges with a series of body weight exercises for 30 seconds on/off for 2 rounds. At night I completed the Plyometric Cardio Circuit of Insanity. I’ve completed 63 days of the Insanity program last year over the summer and was able to lose 7 pounds total but my cardio and endurance was through the roof so this will be my second round. Can’t wait to see what the beast will look like come April 25! Well it’s been awhile since I posted. Truth be told I actually hurt myself while working out. I took a week to do light stretching and popping ibuprofen. My lower back was super tight to the point that it was painful just to lie on my bed. I would get these sharp pains that would come without warning and make me jolt up. On top of that I reinjured my right rotator cup. I picked up my cross bike from my bike mechanic and wanted to take the shortcut home through the limestone trail. Little did I know that sneaky ice patches were hiding under the snow on the trail ninja style. Within seconds I found myself lying on my side kissing the frozen tundra. Lucky for me I didn’t bounce my head. So these last few days I’ve been feeling a whole lot better and did some light workouts to test my shoulder and back. The good news is…The Beast Is Back! I will be able to get on with my 60 Day Challenge starting this Monday. Today I did the second strength class kettlebell workout from Michael Skogg at Home Phase 1 DvD. I followed that up with the first core routine from Keith Weber’s Extreme 2 DvD and finally cooled down with 6 cycles of Sun Salutations. Not going to lie, it felt great to sweat. From not working out, I felt I had come a long way to get where I am now, especially mentally. I was afraid that I would gain weight and go back to where I started from. But I was able to maintain my weight just by eating clean – meats and veggies. Stay tuned for my 60 Day Challenge on Monday! Well for the last several days, my back has been acting up and it’s hard for me to go all out with the kettlebells because I don’t trust my back. It’s my lower right side of my back that’s real tight. I’ve been doing castor oil heat pads and rolling on a foam roller. But I guess the best thing for my back right now is just to stretch and give it a rest. I’m still doing yoga daily and today I did 6 cycles of sun salutations. I’m still keeping up with a clean diet and have finally lost 10 pounds now down to 177.6 lbs. Hopefully my back will start feeling better and I can start my personal 60 day challenge this Monday. Yesterday I started a new self challenge for the next 60 days. Workouts are going to consist of TRX Suspension Training, kettlebells, Insanity, cycling and jump roping. Today’s Workout: The Halves – you are basically halving your reps and rest times. Rest 1 minutes between exercises. ~ Rest 30 seconds ~ Rest 30 seconds between exercises. ~ Rest 15 seconds ~ Rest 15 seconds between exercises. This is a great workout as a warm up or finisher or a workout in itself if you are short on time. Enjoy.